You create the message, you choose who to share it with, you deliver the content when and where you want them to see it. 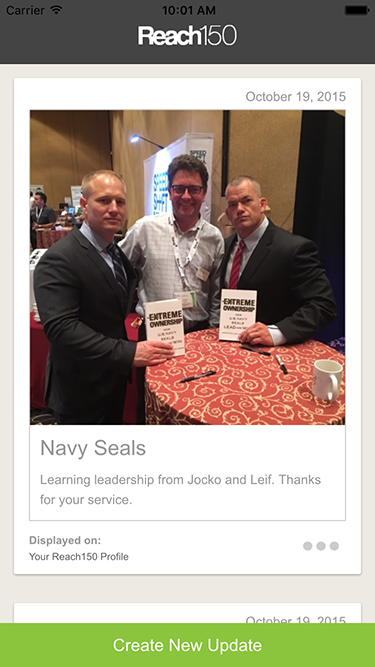 With the new Reach150 mobile application, you now have the ability to create and access an unlimited source of unique content that will provide even more evidence of your industry excellence, and help you create a compelling personal brand. 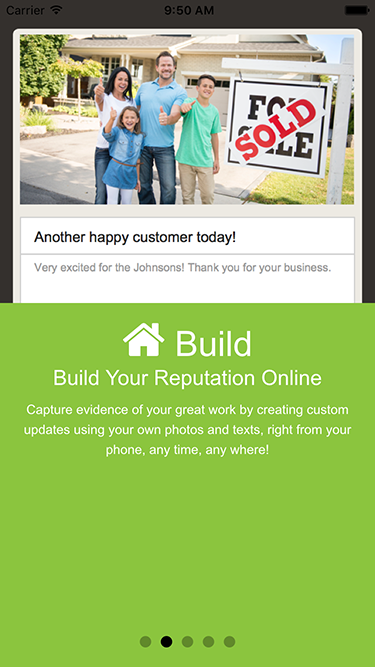 Using photos you take on your phone and by adding your own updates and headlines, you can create powerful custom content that highlights your latest happy client, closing a big deal, specific areas of knowledge, or your involvement in the community. Then, once you create the new custom content on your mobile device, you can develop a targeted message to share with your sphere on your Reach150 profile, through a far reaching online ad network (with retargeting), or your social networks. 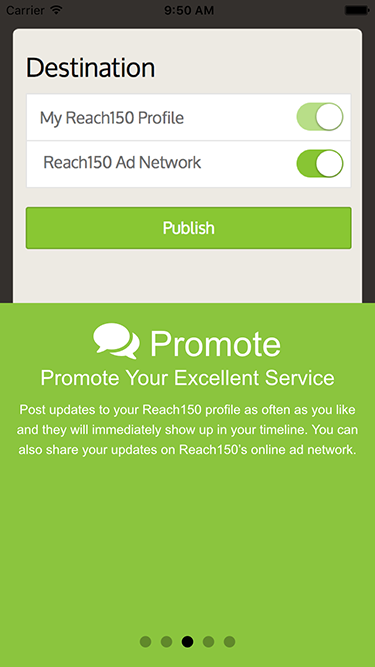 Reach150 Mobile lets you easily capture and create your own custom content and distribute it as updates to your Reach150 profile and in ads across multiple channels from wherever you are throughout your day. Reach150 Mobile is a new app for iOS and Android that lets you use photos you take on your smart phone to create powerful custom content that represents your authentic self – for example, your latest happy client, close of a big deal, specific areas of expertise, or your latest community service activity. 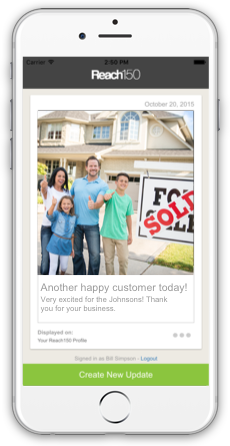 These mobile updates are posted to your Reach150 and social media timelines, as well as to your Reach150 ad network to combine with testimonials to provide further evidence to the great work that you do for your customers. When can I get Reach150 Mobile? Reach150 Mobile is available for iOS and Android today. How do I get Reach150 Mobile? How much does Reach150 Mobile cost? Reach150 Mobile is available for free to all Reach150 users as part of any Reach150 subscription package. Can I post updates taken with Reach150 Mobile to Facebook or other social media? 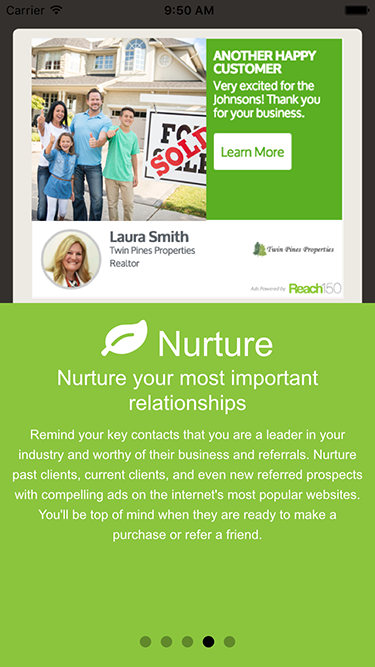 Yes – once you post an update to your Reach150 profile, it can be shared to all of your social sites as well as your email contacts. Can I turn updates from Reach150 Mobile into advertisements? 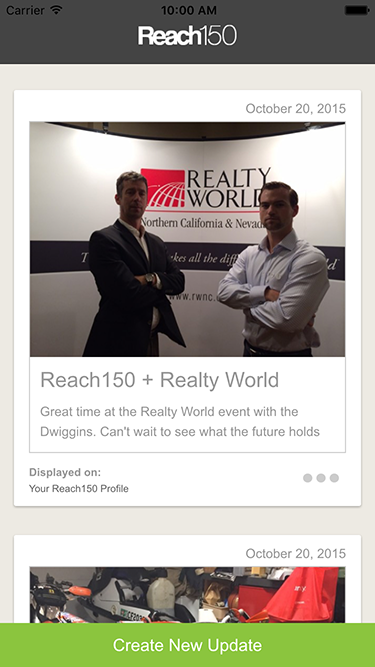 Yes – Reach150 updates can be made into a display ad right in the app. If you chose to post an update as an advertisement, you add a headline and caption and you will see the ad preview right on your smart phone. Once submitted, the ad immediately becomes your current ad for display and retargeting. What iOS devices/versions are supported? Reach150 Mobile for iOS supports any iPhone, iPad or iPod Touch running iOS 8.2 or later, Android phones and tablets running version 4.4 and or later.